All eyes were on the red carpet fashion at Sunday night’s SAG Awards, but now our attention has turned to the burgeoning beauty trends of the night and the biggest emerging look was the up-do. Fabulous frocks require top-notch tresses and Tinseltown’s starriest women didn’t fail to disappoint with their immaculately turned-out top-to-toe style. 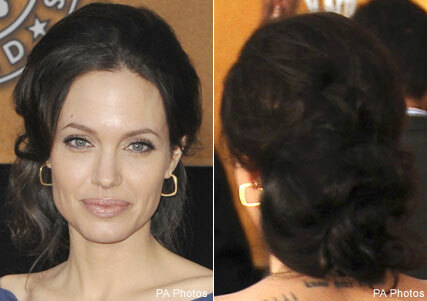 Angelina Jolie’s effortless red carpet elegance has been duplicated time and time again, so it was no surprise to see the Oscar nominee turn out looking radiant again with a romantic asymmetrical hairstyle that softly framed her face. Meanwhile Hollywood’s reigning Queen, Kate Winslet has consistently wowed with her super-preened look in the build up to awards season. At the SAG Awards she worked her voluptuous new shape in a stunning royal blue Narciso Rodriguez gown. Her hair was pulled back into a soft chignon/bun hybrid, with a gentle side-swept fringe framing her face. Although Eva Longoria failed to impress in the SAG Awards style stakes in a rather too frothy tangerine number, her coiled curl up-do showed off the Desperate Housewife star’s perfect frame. With brights in abundance, Christina Applegate also turned heads in an off-the-shoulder Emanuel Ungaro dress. Keen to show off the lines of the dress, Applegate also followed the night’s hair trend, this time with a Grecian-style swirly bun that sat low in the nape of her neck, allowing those fabulous hoop earrings to shine.